Travel Policies establish and communicate guidelines for your business travelers and are crucial to the success of a managed business travel program. The creation and compliance of consistently updated travel policies will assist your company on the issues of traveler safety and security (and satisfaction), corporate responsibility, cost containment, employee compliance and legal protection. Unfortunately, industry studies indicate that many companies have no policy, and less than one-third have consistently reviewed and updated their company policies, placing them at potential risk. Do you know where each of your business travelers is at any time while they are on a trip? Do they know how they should make travel reservations and with which companies? Do you provide direction on which ancillary fees travelers can expense - the number of bags they can check in and pay for, extra leg room, pillows and the list goes on? Do you give direction on the use of mobile technology, particularly when on an international trip? The safety and security of employees who travel on company business has become increasingly more important for all companies. Commonly described as Duty of Care, it is critical that companies provide explicit guidelines for all travelers. Some countries are now enacting laws which require a company to know where all of its employees are at any time. Natural disasters such as tsunamis, earthquakes and ash clouds over the last few years have added additional challenges for companies to know where their travelers are at any particular time. Travel Leaders "Safe to Go" product allows us to provide each client with the most current mobile technologies and important information on the whereabouts and safety of each and every traveler from your company. This is truly Duty of Care in action. This type of service will prevent loss of precious business time, and greatly increase traveler safety and security - all hallmarks of the level of service and convenience sets Travel Leaders apart from other Travel Management Companies. 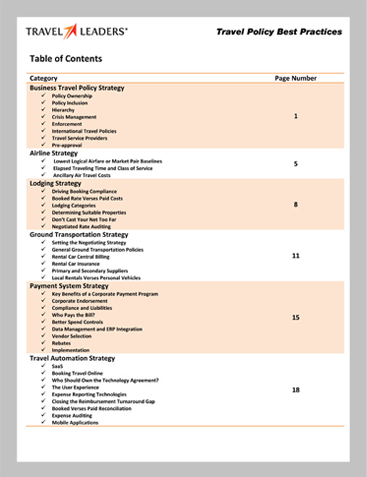 Travel Leaders business travel consulting division has produced a detailed and extensive Travel Policy Best Practice document which will allow Travel Leaders Business Travel Management Services to work with your company and develop your own unique travel policy that meets changing business travel challenges. To meet with a Travel Leaders Business Travel Account Manager and review these best practices, contact us here.